Where college is a scream. High on a hillside overlooking Salem University sits Nightmare Hall. 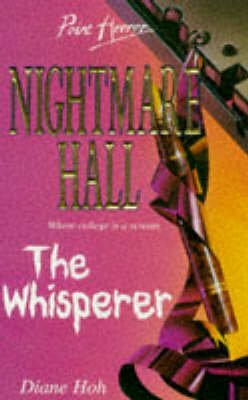 Nightmare Hall, the students call it. Because that's where the terror began...Shea Fallon is hiding a dark secret. She's done something wrong, terribly wrong, and no one must ever find out what she did...But someone has found out. And now Shea is being haunted by a terifying whisper on the phone. A whisper that tells her it knows what she's done...Can Shea stop the whisperer from revealing the truth? Or is she going to have to pay a deadly price?